The turns have never been tighter. The dirt has never been grittier. And the competition has never been this fierce. 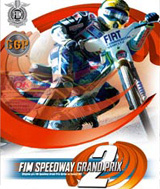 Ride against the best of the best in FIM Speedway Grand Prix, a dynamic, action-packed game where you compete against real motorcycle racers in the world's hottest event, the FIM World Grand Prix. Select from 20 professional riders as you race for the finish line around 10 licensed stadiums in the largest motorcycle speedways in the world.